Richard Kirwan, LL.D, FRS, FRSE MRIA (1 August 1733 – 22 June 1812) was an Irish geologist and chemist. 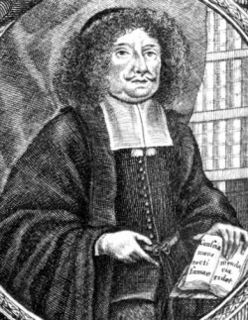 He was one of the last supporters of the theory of phlogiston. Kirwan was active in the fields of chemistry, meteorology, and geology. He was widely known in his day, corresponding and meeting with Lavoisier, Black, Priestley, and Cavendish. Richard Kirwan was born at Cloughballymore, County Galway, the second son of Marty and Martin Kirwan of Cregg (d.1741), and his wife, Mary French (d.1751). He was a descendant of William Ó Ciardhubháin and a member of The Tribes of Galway. Part of his early life was spent abroad, and in 1754 he entered the Jesuit novitiate either at St Omer or at Hesdin, but returned to Ireland in the following year, when he succeeded to the family estates through the death of his brother in a duel. Kirwan married "Miss Blake" in 1757, but his wife only lived eight more years. The couple had two daughters, Maria Theresa and Eliza. 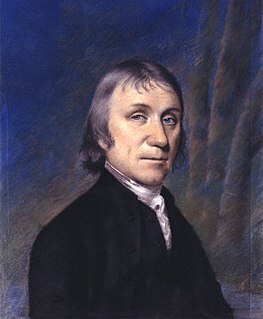 In 1766, having conformed to the established religion two years previously, Kirwan was called to the Irish bar, but in 1768 abandoned practice in favour of scientific pursuits. During the next nineteen years he resided chiefly in London, enjoying the society of the scientific men living there, and corresponding with many savants on the continent of Europe, as his wide knowledge of languages enabled him to do with ease. His experiments on the specific gravities and attractive powers of various saline substances formed a substantial contribution to the methods of analytical chemistry, and in 1782 gained him the Copley medal from the Royal Society, of which he was elected a fellow in 1780; and in 1784 he was engaged in a controversy with Henry Cavendish in regard to the latter's experiments on air. In 1784, he was elected a foreign member of the Royal Swedish Academy of Sciences. In 1787 Kirwan moved to Dublin, where, in 1799, he became president of the Royal Irish Academy until his death. To its proceedings he contributed some thirty-eight memoirs, dealing with meteorology, pure and applied chemistry, geology, magnetism and philology. One of these, on the primitive state of the globe and its subsequent catastrophe, involved him in a lively dispute with the upholders of the Huttonian theory. His geological work was marred by an implicit belief in the universal deluge, and through finding fossils associated with the trap rocks near Portrush he maintained basalt was of aqueous origin. Kirwan was one of the last supporters in Britain and Ireland of the theory of phlogiston, for which he contended in his Essay on Phlogiston and the Constitution of Acids (1787), identifying phlogiston with hydrogen. This work, translated by Marie-Anne Pierette Paulze, was published in French with critical notes by Lavoisier and some of his associates; Kirwan attempted to refute their arguments, but they proved too strong for him, and he acknowledged himself a convert in 1791. Various stories are told of Kirwan's eccentricities as well as of his conversational powers. It is said that flies "were his especial aversion; he kept a pet eagle, and was attended by six large dogs." There is evidence to suggest that Kirwan was a member of the Society of the United Irishmen, a revolutionary republican organisation in 18th century Ireland. The United Irishmen were founded as a reformist club by a group of radical Presbyterians in 1791, influenced by the American and French revolutions. Gradually becoming more militant; the Society advocated for Catholic emancipation, and the overthrow in Ireland of British rule. This movement culminated in the defeat of the United Irishmen in the 1798 Rebellion and the Act of Union. At the time of the Union, Kirwan refused a baronetcy and died in Dublin in June 1812, and was buried there in St. George's Church, Lower Temple Street. ^ Berry, Henry Fitz-Patrick (1915). A History of the Royal Dublin Society. London: Longmans, Green and Co. pp. 154–158. ISBN 1-4374-5669-3. Retrieved 15 December 2007. ^ a b Reilly, R.; N. O'Flynn (February 1930). "Richard Kirwan, an Irish Chemist of the Eighteenth Century". Isis. 13 (2): 298–319. doi:10.1086/346457. ^ Dixon, F. E. (December 1969). "Some Irish Meteorologists". The Irish Astronomical Journal. 9: 113–119. Bibcode:1969IrAJ....9..113D. ^ Stephen, Leslie, ed. (1887). "Kirwan, Richard" . Dictionary of National Biography. 11. London: Smith, Elder & Co. pp. 228–230. ^ Deane, S. & B. Mac Suibhne (2008). "Science and Medicine in Nineteenth-Century Ireland". Field Day Review. 2: 285–293. Akeroyd, Michael (2003). "The Lavoisier-Kirwan debate and approaches to the evaluation of theories". Ann. N. Y. Acad. Sci. (published May 2003). 988: 293–301. Bibcode:2003NYASA.988..293A. doi:10.1111/j.1749-6632.2003.tb06110.x. PMID 12796114. Donovan, M. (1848). "Memoir of R. Kirwan". Proceedings of the Royal Irish Academy. 4: 81. Mauskopf, Seymour (2002). "Richard Kirwan's phlogiston theory: its success and fate". Ambix (published November 2002). 49 (3): 185–205. doi:10.1179/amb.2002.49.3.185. PMID 12833914. Reilly, D. (May 1950). "Irish Chemical Pioneers of 150 Years Ago". Journal of Chemical Education. 27 (5): 237–240. Bibcode:1950JChEd..27..237R. doi:10.1021/ed027p237. Reilly, R.; N. O'Flynn (February 1930). "Richard Kirwan, an Irish Chemist of the Eighteenth Century". Isis. 13 (2): 298–319. doi:10.1086/346457. Smith, Edgar Fahs (1926). "Forgotten Chemists". Journal of Chemical Education. 3 (1): 29–40. Bibcode:1926JChEd...3...29S. doi:10.1021/ed003p29. Wyse Jackson, Patrick (1998). "Richard Kirwan (1733–1812): Chemist and Geologist". Irish Chemical News. 12: 36–39. Deane, S. & B. Mac Suibhne (2008). "Science and Medicine in Nineteenth-Century Ireland". Field Day Review. 2: 285–293. Berry, Henry Fitz-Patrick (1915). A History of the Royal Dublin Society. London: Longmans, Green and Co. pp. 154–158. ISBN 1-4374-5669-3. Retrieved 15 December 2007. Dixon, F. E. (December 1969). "Some Irish Meteorologists". The Irish Astronomical Journal. 9: 113–119. Bibcode:1969IrAJ....9..113D. Thomson, Thomas (1818). A System of Chemistry (5 ed.). Philadelphia: Abraham Small. pp. 124–126. ISBN 0-03-024952-X. This article incorporates text from a publication now in the public domain: Chisholm, Hugh, ed. (1911). "Kirwan, Richard" . Encyclopædia Britannica. 15 (11th ed.). Cambridge University Press. p. 834. Antoine-Laurent de Lavoisier was a French nobleman and chemist who was central to the 18th-century chemical revolution and who had a large influence on both the history of chemistry and the history of biology. He is widely considered in popular literature as the "father of modern chemistry". Claude Louis Berthollet was a Savoyard-French chemist who became vice president of the French Senate in 1804. He is known for his scientific contributions to theory of chemical equilibria via the mechanism of reverse chemical reactions, and for his contribution to modern chemical nomenclature. On a practical basis, Berthollet was the first to demonstrate the bleaching action of chlorine gas, and was first to develop a solution of sodium hypochlorite as a modern bleaching agent. The phlogiston theory is a superseded scientific theory that postulated that a fire-like element called phlogiston is contained within combustible bodies and released during combustion. The name comes from the Ancient Greek φλογιστόν phlogistón, from φλόξ phlóx (flame). It was first stated in 1667 by Johann Joachim Becher and then put together more formally by Georg Ernst Stahl. The theory attempted to explain processes such as combustion and rusting, which are now collectively known as oxidation. 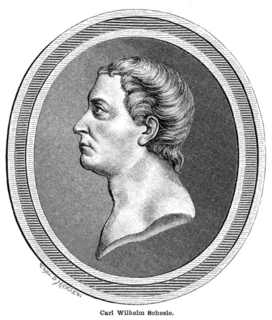 Carl Wilhelm Scheele was a Swedish Pomeranian and German pharmaceutical chemist. Isaac Asimov called him "hard-luck Scheele" because he made a number of chemical discoveries before others who are generally given the credit. For example, Scheele discovered oxygen, and identified molybdenum, tungsten, barium, hydrogen, and chlorine before Humphry Davy, among others. Scheele discovered organic acids tartaric, oxalic, uric, lactic, and citric, as well as hydrofluoric, hydrocyanic, and arsenic acids. He preferred speaking German to Swedish his whole life, as German was commonly spoken among Swedish pharmacists. Nils Gabriel Sefström was a Swedish chemist. Sefström was a student of Berzelius and, when studying the brittleness of steel in 1830, he rediscovered a new chemical element, to which he gave the name vanadium. Guillaume François Rouelle was a French chemist and apothecary. In 1754 he introduced the concept of a base into chemistry, as a substance which reacts with an acid to give it solid form. William Nicholson was a renowned English chemist and writer on "natural philosophy" and chemistry, as well as a translator, journalist, publisher, scientist, inventor, patent agent and civil engineer. Johan Gadolin was a Finnish chemist, physicist and mineralogist. Gadolin discovered a "new earth" containing the first rare-earth compound yttrium, which was later determined to be a chemical element. He is also considered the founder of Finnish chemistry research, as the second holder of the Chair of Chemistry at the Royal Academy of Turku. Gadolin was ennobled for his achievements and awarded the Order of Saint Vladimir and the Order of Saint Anna. The chemical revolution, also called the first chemical revolution, was the early modern reformulation of chemistry that culminated in the law of conservation of mass and the oxygen theory of combustion. During the 19th and 20th century, this transformation was credited to the work of the French chemist Antoine Lavoisier. However, recent work on the history of early modern chemistry considers the chemical revolution to consist of gradual changes in chemical theory and practice that emerged over a period of two centuries. The so-called scientific revolution took place during the sixteenth and seventeenth centuries whereas the chemical revolution took place during the seventeenth and eighteenth centuries. Cato Maximilian Guldberg was a Norwegian mathematician and chemist. Guldberg is best known as a pioneer in physical chemistry. Marie-Anne Pierrette Paulze was a French chemist and noble. Madame Lavoisier was the wife of the chemist and nobleman Antoine Lavoisier, and acted as his laboratory companion and contributed to his work. She played a pivotal role in the translation of several scientific works, and was instrumental to the standardization of the scientific method. Carl Johann Philipp Noé Richard Anschütz FRSE (Hon) was a German organic chemist. Lorenz Florenz Friedrich von Crell was a German chemist. In 1778 he started publishing the first periodical journal focusing on chemistry. The journal had a longer title, but was known simply as Crell's Annalen. Marsilio Landriani was an Italian chemist, physicist and meteorologist. He became known with his first book, Ricerche fisiche intorno alla salubrità dell'aria, published in 1775. In it he described a new instrument, the eudiometer, which was later improved by Volta with the addition of spark wires. From 1776 he held the chair of experimental physics in the Brera Ginnasio (College). In 1781 he published his second book, Opuscoli fisico-chimici, which contributed to opening a new way to the theory of acidity. Claudine Picardet was a chemist, mineralogist, meteorologist and scientific translator. Among the French chemists of the late eighteenth century she stands out for her extensive translations of scientific literature from Swedish, English, German and Italian to French. She translated three books and thousands of pages of scientific papers, which were published as well as circulated in manuscript form. She hosted renowned scientific and literary salons in Dijon and Paris, and was an active participant in the collection of meteorological data. She helped to establish Dijon and Paris as scientific centers, substantially contributing to the spread of scientific knowledge during a critical period in the chemical revolution.